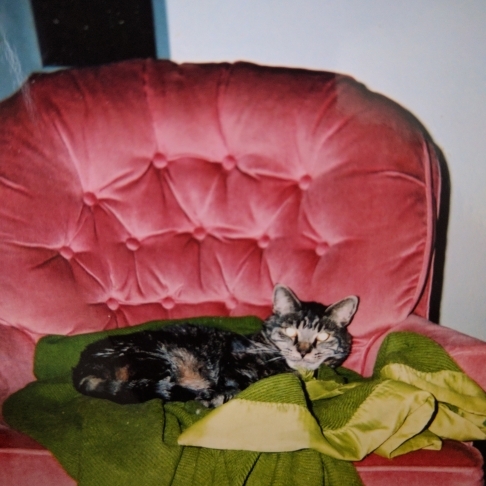 I was adopted to Marina at the age of 4 years since my original owners a family with 5 kids who raised me since I was a kitten were moving to New Zealand and they couldn’t take them as a result of expenses due to my having to be quarantined . So in turn my former owners during the fall of 1993 had decided to instead put an ad about me in the local community weekly newspaper, to see if someone would have been interested in giving me a very good home. Sure enough it wasn’t long before my mama Marina had spotted my ad about me in the paper in which she quickly had inquired about me. I guess mama Marina was also looking for a new cat around the time she had found my ad. Because several months earlier mama Marina’s previous calico cat Puss Puss had disappeared and never returned. The next thing came of our meeting one another at the home of Auntie Marina’s. Upon our first meeting mama Marina and I felt uncertain about one another although Mama Marina had decided to keep me after all because she didn’t have the heart to give me back to my former owners. And I am glad she kept me because it wasn’t long before I started to love my new mama Marina and realize how good she was going to be to me. At first during the early weeks after my meeting mama Marina, it took quite a while to adjust to living without my former owners and adjusting to mama Marina. However, the younger kids from my previous family did come to visit me before they finally had left for New Zealand although before they had left , me and my mama Marina were given a lovely gifts by my previous family to commemorate my new life with mama Marina. I stayed with my mama Marina until she moved out on her own and had left me to stay with Mama Marinas mama who took very good care of me. Mama Marina did try to take me into her new home but I didn’t like it there at first so I was brought back to mama Marinas mamas place until my mamas mother had decided to sell her home. Before I forget that after Mama Marina moved away she did come by to visit and stay during the weekends which was great and had enjoyed our visits together. After my mamas mother had moved into an apartment I went back to live with my mama Marina to live the life of contentment and lots of love that were continually showered .upon me from mama as well as others. During the summer of 2001 I suddenly had become ill which later was learned that I had developed kidney failure which was related from kidney damage, as a result of an infectious bacteria that invaded my teeth. However, at first I was at first scheduled to be put down for I was in bad shape although at the last minute the vet felt I was improving so in turn had thought there was a possible chance I would recover. Despite the removal of one of my teeth and the trial of medications, special kidney diet I unfortunately had become ill again to the point where I was looking for a place around the house to pick as my final resting place. So on August 25, 2001 the vet had felt it was best that I to be put down. It was a hard decision for my mama Marina to have made which of course devestated her. And so is when my arrival at Rainbow Bridge had begun. My wish after I had left for Rainbow Bridge is that I had wanted my Mama Marina to have a new special kitty to love and be a good mama to just as she was to me . As luck would have it later in the afternooon several hours after my passing, I had helped Mama Marina in my own magical way for her pick out a wonderful little special kitty that needed all the love and attention. It was part of my message and mission of leaving my legacy and spirit into Mama Marinas new kitty Scampie. And I think Scampie knew of the above because once he met his new mama Marina he just KNEW she was the mama for him.